At ebm-papst, Every Day is a GreenDay! While last Wednesday’s showers prevented an outdoor celebration, the weather didn’t dampen our Every Day is a Green Day luncheon at ebm-papst’s US headquarters in Farmington, Connecticut. Employees have been preparing for this day by bringing their old and outdated electronic devices to the office for recycling. 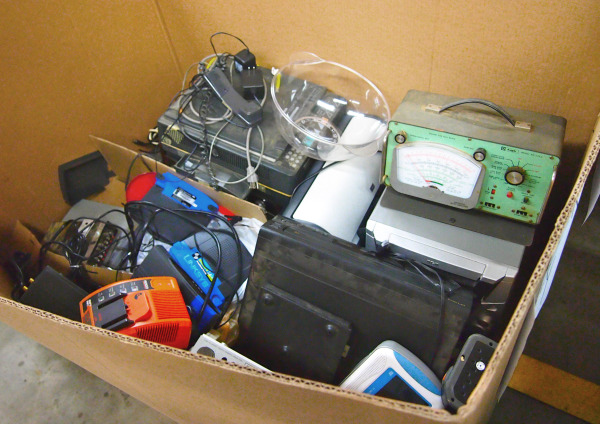 Just a small sampling of the many electronics collected this week! Employees also took the opportunity to purchase energy efficient and environmentally friendly CFL lighting from TechniArt, Inc. and had the ability to shred personal documents with Cintas. After eating locally-sourced hot dogs, burgers and strawberry shortcake, we learned what many employees do to be green at home and work with a trivia contest. “At work, I requested a filtration system for the Deburring Machine, and was granted... My house has energy efficient insulation, windows, faucets, thermostats on a timer set for occupancy times, no greater than 58°F. We grow our own vegetables, fruits, have a compost bin for the garbage. I have rain barrels to catch rain water for plants, a wood stove heats our house. Our town has, and we utilize, a transfer station, recycle bins. We have solar panels for hot water. We have CFLs throughout the house (inside & outside).” Thomas Dunbar, Facilities Maintenance. “I supplement my transportation needs with an electric bicycle of my own design. Counting the 28 miles I put on it this weekend, I’ve logged over 12,300 miles on it. I use solar thermal panels of my own design to supplement my upstairs heating in the winter time. The panels use a re-programmed older revision ALU board and sample 5000 series fans from the previous decade. I drive a Smart car which has cut my commuting gas consumption in half. I’ve switched over to LED lighting in approximately half of my household.” Charles Blow, Design Engineer. We also formally ‘threw the switch’ on the power inverter to begin converting energy produced by the new, additional 50 kilowatts of solar panels on the roof of our production facility into power for our facility for a total of 100 kw now installed. When that power isn’t needed, we’re sending excess power back to ‘the grid’. 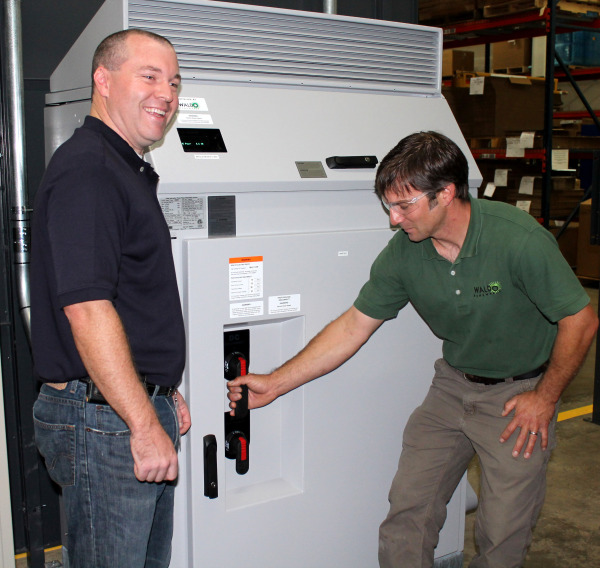 ebm-papst President and CEO Bob Sobolowski and Vice President of Engineering Scott Beauchamin with Mark Waldo, president of Waldo Electric, with Waldo’s energy inverter in the plant’s power control room. 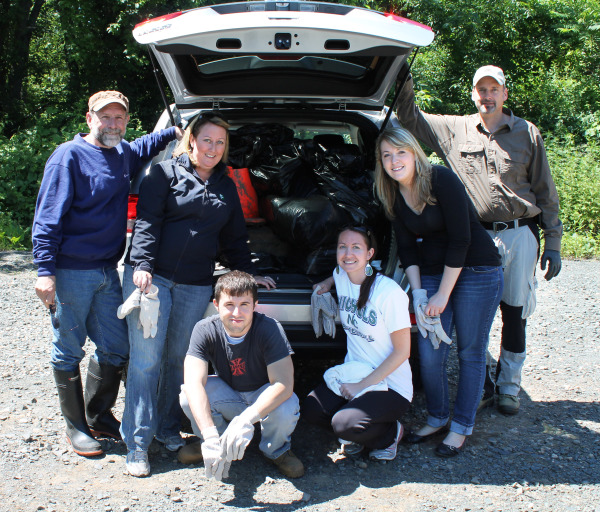 On Friday, the trash pickup team from ebm-papst donned tear proof clothing and braved weeds, thorns and wild animals to haul hidden trash from a public area next to Farmington River off of Route 4. 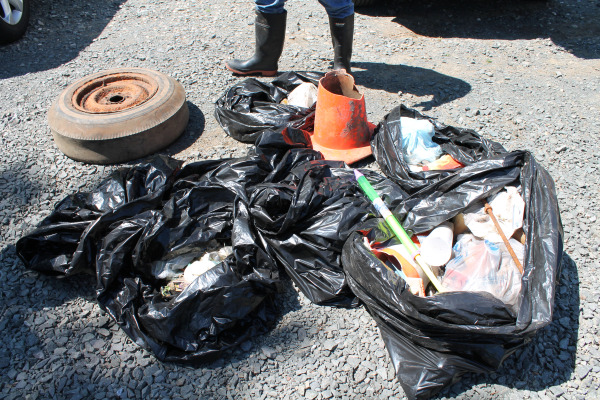 Among the interesting items we found: tires and traffic cones! A closing newsletter was sent out to all employees, highlighting the winners of the trivia contest. A compilation of tips from all of the contest entries was included, to encourage the employees of ebm-papst to continue living a green life style. Every Day is a GreenDay!